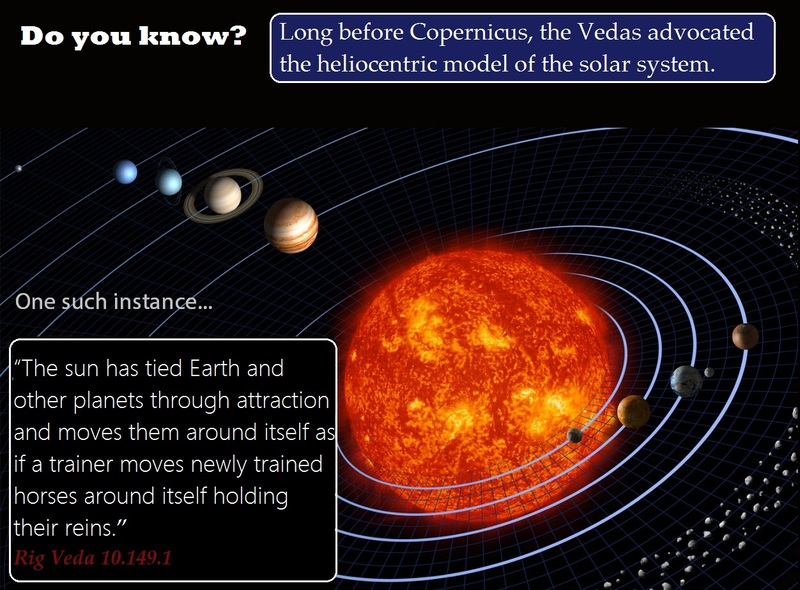 The fact that the sun is the centre of solar system was also known to us from ancient times.This was much before the discovery of this fact by the Europeans. The Bharatiya culture has always been knowledge-centred. "The sun holds the earth and the celestial region. The sun is the attracting power of all heavenly bodies." 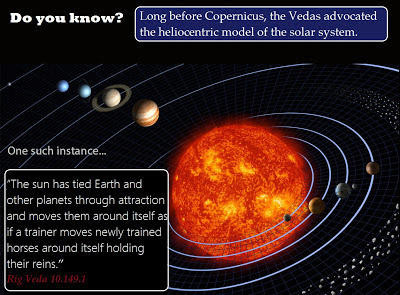 Long before Copernicus, the Vedas advocated the heliocentric model of the solar system. The shining beautiful celestial Red Ball (sun), the ocean of fire, whose light brings us rains, finds its place in the vast Antariksha – the space. The sun possessing Prishnirasma, the matter responsible for solar energy/electricity and colors got its position in ‘the centre of heaven’ (solar system) and it protects the whole world (solar family) and demarcates the east and west directions within the solar family! 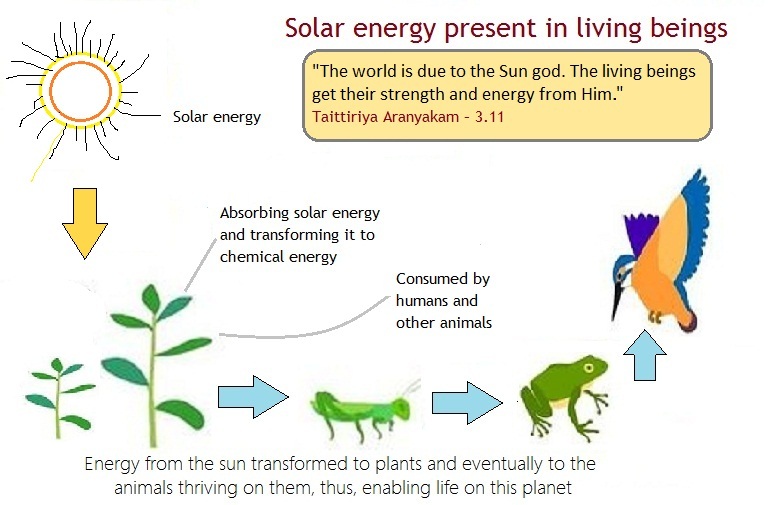 The fact that sun is the source of energy was well known to Indians from ancient times. "The world is due to the Sun god. The living beings get their strength and energy from Him." Who is the Sun God? God is not some person sitting somewhere at some place. It is a field of energy which is present everywhere and at all times and in all forms. Just as white light is composed of many colours, god is considered as the collective sum of all energies that exist. 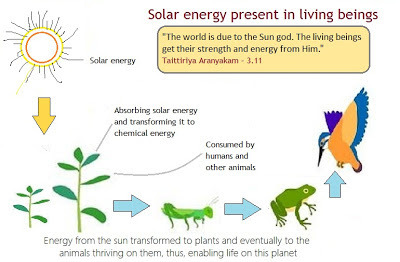 Everything that is life sustaining on this planet was considered as god or part of god in India. The sun is the source of energy for our planet. Plants prepare food with the help of sunlight. It is responsible for the water cycle on earth. The solar system exists due to the sun. In short, life exists due to the sun. Like the sun, water, fire, air were also considered as different manifestations of god. Do you think the energy which is responsible for life on this planet is inert or lifeless? If the sun dies, the life on this planet would extinguish. In fact, all of the solar system would get destroyed. No planets! No life! Recent science says that 20 minutes of morning light is best for the body to produce essential Vitamin D and achieve hormone balance. 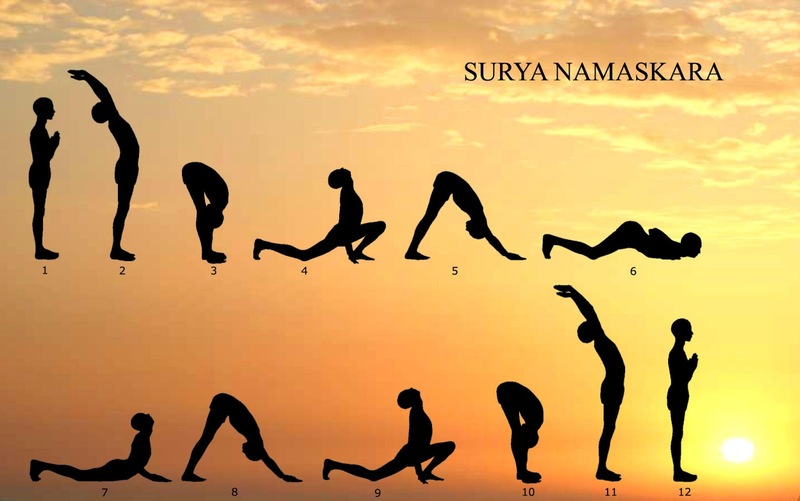 Exercising, meditating and praying all combined into one are the sun salutations. It is very beneficial to the eyes. It also has a soothing and calming effect on the mind. 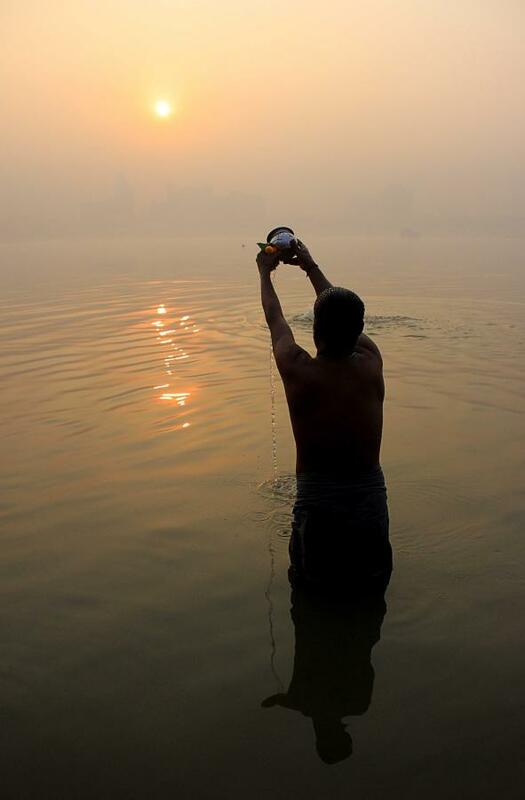 The process is to take water in the hands and offer it slowly to the rising sun while watching it. Watching the rising sun is good but if done for long time it can harm the eyes. The secret here is - Watch the rising sun for few seconds and this was accomplished by offering a little water. It worked as a timer. Also the early morning rays mix with the water being offered and it is such a beautiful phenomenon. Try it once...Its really beautiful! Really awesome, very thank full for info.